The sweatshirts have a drawstring through the hood that can pose a strangulation hazard to children. 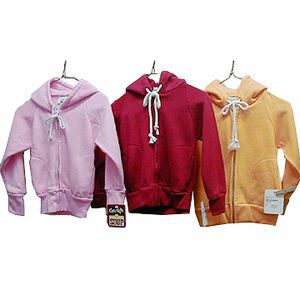 This recall involves about 70 "Happy Kids" brand hooded sweatshirts sold as part of a set. The sweatshirt and pants sets were sold in pink, red, yellow and green, and in sizes 2T through 6X. "Happy Kids" is printed on the neck tag inside the sweatshirts. Chocolate Soup stores in Georgia, Texas, Tennessee, Missouri and North Carolina from June 2009 to February 2010 for about $45. Immediately remove the drawstrings from the sweatshirts to eliminate the hazard or return the product to the store where purchased for a full refund. For more information, contact Chocolate Soup collect at (314) 576-1221 between 10 a.m. and 6 p.m. ET Monday through Friday.